Can you even remember when you last changed things up in bed? I mean your mattress! What did you think I meant? What is a Foam Rubber Mattress? 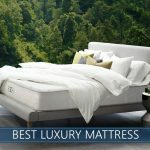 As you have started to think about this and shop around, you might have seen some great mattress options out there (like our list of best mattresses for 2019). But you're interested in finding the best latex mattress on the market. When it comes to durability, you really will have a hard time beating one. But you might have questions when it comes to replacing one of the most vital components of your old bed. Not to worry! Do you have pressure points that cause you pain? Do you end up feeling hot when you are sleeping on other kinds of surfaces? Are you looking for a product you can customize? Do you have a sleeping partner? Are you in the market for a green, eco-friendly solution? If any of your answers to these questions are yes, then a mattress composed of latex could represent an ideal solution. Of course, making a change can be concerning. After all, we are talking about where you sleep! You are going to spend approximately one third of your entire lifetime in bed. Why not make sure that time is as comfortable as possible? In addition, considering the durability issue, wouldn’t it be great to not have to worry about replacing any part of your bed for a long time? When we talk about latex foam benefits, we have to talk about the material’s resistance to mold, mildew, and dust mites. If you are a dust mite allergy sufferer, then keeping their population down is key. Do not give them a safe haven! Instead, foam made out of this material sends them packing. Keeping the allergens out is going to help you have a more restful sleep as your airways are going to stay clearer. And – bonus! – It will also help anyone else in your bed have a more restful sleep. You sneezing or coughing in the middle of the night will not wake them up if you can find a product that ends your coughing or sneezing. And that is going to be a lot more comfortable for everyone. Or are you always hot at night? Whether that is due to hot flashes, or you are just plain warm at night, a latex-style foam can keep you a lot cooler. And consider the issue of support. If you have joint pain, such as from arthritis, or maybe a bad back or knees, the last thing you want is for your bed to sink in too much. You need for it to hold you up. However, at the same time, you do not want to be sleeping on a board. Here is where this material can really shine, as it does double duty. It can support and cradle your form while, at the same time, it will give and shape to your body. Say goodbye to nights where stiff joints are bent like a pretzel as you struggle to get comfortable. We took a look at seven top rated latex mattresses and compared them so you won’t have to. And without further ado, here are the results of our investigations. 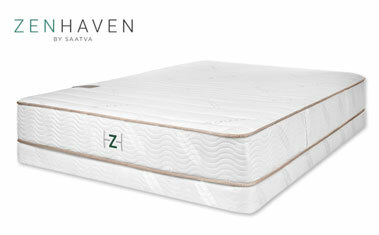 Zenhaven by Saatva has four distinct layers of high-quality Talalay in this all-latex bed. Naturally resistant to body heat, dust mites, and mold, and with many raving consumer reports, it has a lot to offer. Within the bed, there are five zones with pinholes of different sizes and densities to provide great lumbar support and pressure relief. Crafted almost completely from natural materials, including natural latex, an organic wool flame-retardant barrier, and an organic cotton cover, the design is impressively eco-friendly. It feels luxurious and works well for people who value hypoallergenic and natural materials. What makes it unique? From the use of natural materials and premium Talalay to pinpointed zoning, Zenhaven offers an incredible overall value. The mattress is double-sized with Luxury Plush and Gentle Firm options, so you can test two firmness levels during their generous 120-day trial period to see if a soft latex feel or a firmer feel is more comfortable. While most buyers choose their Luxury Plush option, those who need more support (like stomach sleepers) might enjoy the Gentle Firm side more. 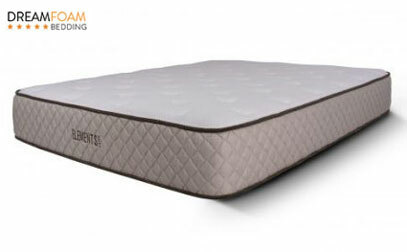 The convenience of two firmness levels and the quality of the materials makes it an all-around great buy. It comes with White Glove Delivery service, where a team will install the Zenhaven and remove your old bed for free. See more info in our in-depth Zenhaven analysis. Botanical Bliss stands apart in the industry. Made with organic ARPICO latex from the sap of rubber trees, it gently cradles sleepers while providing quick responsiveness and bounce. Allergy sufferers and people who worry about chemicals are likely to find a solution with this product. Because of its natural and organic materials, there is no smell after unboxing, dangerous chemicals, or harmful glues to worry about. Why is it special? Botanical Bliss has certified organic materials – such as its cotton cover and ARPICO latex – as well as an organic New Zealand wool fire barrier. Very few mattresses claim this level of natural and organic materials, and their quality makes the bed well worth its price for many. Botanical Bliss can be ordered in one of three firmness levels (Soft, Medium, and Medium-Firm) in heights of 9, 10, and 12 inches. If you find you want to adjust the firmness, the company will send you a replacement piece of Talalay per their free in-home comfort exchange offer during the trial period. Want to know more? Check out our full review of the Botanical Bliss. 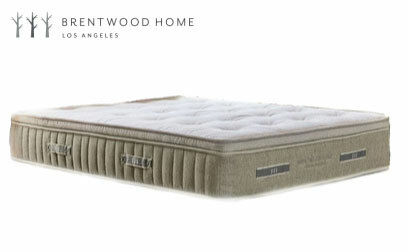 Cedar Mattress by Brentwood Home is a hybrid created with natural Dunlop latex, innersprings, and materials such as coconut husks, organic cotton, New Zealand wool, and flaxseed. It has a high level of natural materials and a supportive coil unit that is zoned for additional edge and lumbar support. An exciting feature of the Cedar is the grooved quality in the second layer of Dunlop, which is zoned for additional pressure relief and has the benefit of increased airflow. Unlike latex beds that can feel too firm, the construction of the Dunlop, along with the cotton and wool on top, create a comfortable medium level of firmness. This particularly excellent news for side sleepers who want a more natural option but tend to think that latex sleeps too firm. What stands out? The design incorporates the benefits of support, pressure relief, strong edges, and the bounce of a high-quality hybrid. The bed has good cooling qualities, from aerated and grooved foam to 8-inch coils that allow plenty of air to flow through the bed. Cedar features button tufting to keep the layers in place, meaning that the mattress is held together without harmful glues. While shipping is free, the company offers optional White Glove Delivery for an additional cost (King and California King order receive this service for free). Nature’s Novel by Sweet Zzz has four layers of latex, foam, and wool that work together to provide the right amount of support all night. The brand has proudly designed their product to last alongside its lifetime warranty. The cover is made from cotton and filled with an inch of natural wool fiber that creates a soft first impression. The bed is constructed with an open-cell design that discourages moisture and promotes temperature regulation. What makes it unique? There are two types of latex in Nature’s Novel that serve different functions. 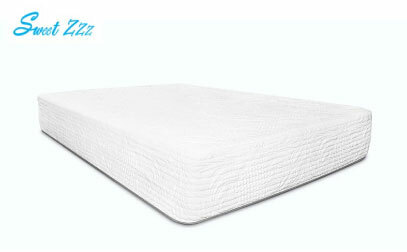 Sweet Zzz uses layers of Talalay and Dunlop to create contouring and support. Its slightly firmer feel works especially well for stomach and back sleepers. Nature’s Novel can be used on any flat surface or a slatted bed or flat box spring. It is also compatible with adjustable bases, so you can sleep or lounge in optimal comfort. The company has a partnership with the Los Angeles Regional Food Bank, which means your purchase helps others. For every mattress sold, 20 meals are supplied for people in need. Our pick for couples combines latex and coils for a superior feel and added durability. It comes in Medium and Firm options, which you can change easily by unzipping the cover and replacing the latex layer if you need a softer or firmer feel. The cover is made from organic cotton with a wool and cotton quilt underneath. Latex is known for its temperature regulation capabilities, especially when aerated like this Nest Bedding model. Combined with the pocketed coil layer that has air throughout it, this bed sleeps very cool. Adjusting positions is easy, as the coils and latex are both quick-responding materials. Why is it special? Nest Bedding offers split comfort options, so you can have two different firmness levels side-by-side. This will help each person experience their best night’s sleep, with sides tailored to their personal preferences and sleeping positions. This bed is a great value with the benefits of a latex and coil hybrid design, such as increased airflow, bounce, and great edge support. The company will even supply organic Dunlop latex by request. We love its adjustable comfort capabilities and handles that make it simple to move, too! 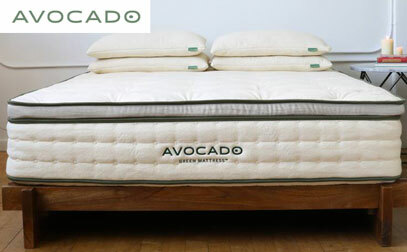 Avocado is a brand that fulfills its environmentally conscious business vision one mattress at a time. Their bed is a hybrid design backed by many eco-friendly certifications that includes a high level of natural materials and upcycled coils. When ordering the Avocado, you can choose to add a pillow top layer to the standard version. Those who like a slightly firmer feel (such as stomach and some back sleepers) may enjoy the standard version, while those who want more of a medium to medium-firm feel can select the pillow top, which has two additional inches of Dunlop latex. What stands out? Avocado’s eco-friendly design uses mostly natural, organic, and upcycled materials, including natural Dunlop latex, Joma® New Zealand Wool, and certified organic cotton. Another notable feature is its edge-to-edge coil system that has three zones with additional support in heavier areas for proper spine alignment. They are individually pocketed, which helps to isolate movement for lower motion transfer. The perimeter springs have also been reinforced, creating a strong edge that is impressive in a bed-in-a-box model. Head over to our complete Avocado analysis to find out everything that you need. As the least expensive model on this list, Ultimate Dreams provides great value sale with features that are both impressive at its price point and unique to this list. It utilizes high-quality Talalay latex over a convoluted dense foam base that is designed to increase airflow and keep sleepers cool. Its cover is made from bamboo fibers that are 100% biodegradable, which the brand claims have a softer feel than cotton and over four times more moisture wicking capabilities. It is quilted with a reflex foam for added comfort. Why is it special? It is an amazing budget pick that uses quality materials in its construction, all supplied by a trusted brand. The company behind Ultimate Dreams owns their own factory, which enables them to cut out middlemen and pass significant savings to their customers. They use high-end materials and create solid products while keeping costs low for everyone. Latex beds, at their core, are made from a rubberized material that has been whipped into a foam. This material has then been molded and cured (nearly always with pincore holes) in sheets that can be stacked on top of similar materials or integrated with others. It is extremely versatile, serving a variety of functions from cooling to contouring. It is often hailed as a top material type due to the problems it solves for sleepers who have used other materials in the past. Keep reading to find out even more regarding the differences in organic, natural, synthetic, and blended types. Latex dates back as far as the fourth century BC. But of course, that is the true article, the real deal. Synthetic rubber, in contrast, dates back to the early part of the last century. The demand for synthetics can be traced in a direct line to the rise of the automobile. With a sudden skyrocketing increase in demand, natural sources could not keep up. The Bayer laboratory (the same people who worked on aspirin) succeeded in the polymerization of isoprene in 1909. 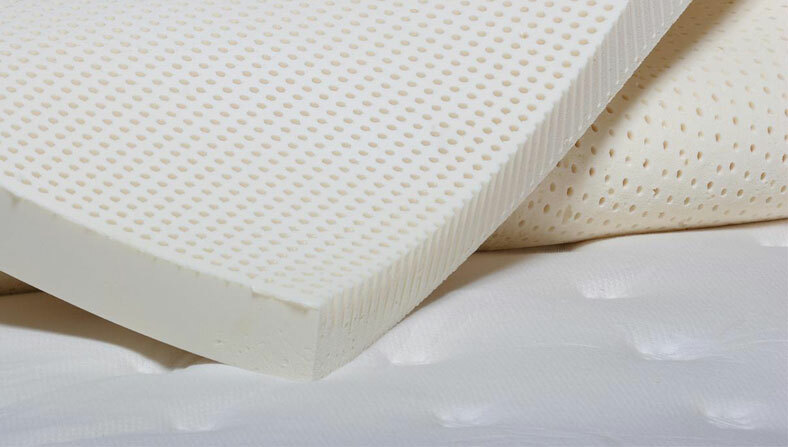 When you are considering a high rated latex mattress, you might be thinking about the differences between synthetic and natural, or whether you should split the difference and go with a blend. When we talk about latex, it is going to either be all-natural rubber, or a synthetic, or a mashup of those two types. When it comes to natural rubber, it is harvested by a method that is a lot like tapping and extracting sap for maple syrup. Synthetic rubber is, of course, a man-made creation. And as you might expect, a blend is just these two types put together. The most significant upside to synthetics is the price. However, they can have a rather strong rubbery smell, particularly in the first few days, so keep that in mind. On the other hand, naturals should not have that problem. In addition, an organic commodity is, by definition, a greener and more ecologically friendly solution. However, the price differential is a rather significant one. For a natural product, you are looking at a price point difference which could easily be close to twice that for a man-made item. However, as with other commodities which are purchased and are intended to last for a meaningful amount of time, a natural polymer is going to stand you in good stead for many years to come. An organic solution is also sometimes preferable when it comes to the possibility of customization. During manufacture, you can specify the firmness level in many cases, even for each side. Therefore, if your partner prefers more lumbar support, then he or she can get it – and you are not going to have to compromise if you do not need it. Without compromises, both of you can get a better night’s sleep. And that is a recipe for a far better morning. And be sure to keep in mind – it cannot be considered to be truly organic or natural unless it really is. Therefore, check the component materials closely. You do not want to be paying premium prices for a fully organic article when it turns out it is only partly organic! In addition, it is not just the fact that it is organic that makes it a more eco-friendly solution. It is also natural rubber’s not so secret weapon – durability. A lasting product of any sort is a direct counter to our often throwaway culture, and your bedding is no exception when it comes to trying to save the planet. So, if your organic purchase lasts as long as two or maybe even three iterations of a not-so organic version, that can mean fewer materials ending up in landfills. There are two main methods for producing the latex that goes into beds. Dunlop came first, so let’s look at it before we get to Talalay. In the Dunlop process, much like for any rubber manufacture, the first step is to tap rubber trees and gather liquid latex. The collected material is then whipped up and placed into a mold. After that, the contents of the mold are heated inside a hot oven. When this part of the process is completed, the transformed material is then cleaned. As a side benefit, any moisture within the material is released through the heating part of the process. The advantage to this process is that the mold is filled completely, thereby resulting in the creation of one larger, continuous piece. This causes some of the material to settle at the bottom of the mold. The advantage to that is the firmer feel on one side, while the disadvantage is nearly the same thing, that the firmness is inconsistent. Overall, Dunlop process material has a good bounce to it. Talalay latex foam differs from Dunlop in that only some latex is poured into the mold. This allows for expansion of the latex. The next step is to extract the air. This results in a configuration with an open-cell structure, and then small pathways have a cooling effect. Then the latex is flash-frozen and split into multiple sections. These individual pieces are then sometimes glued together for the express purpose of making the final form. The Talalay process results in a bouncy product that stays cool. It responds well to pressure and the look, feel, and performance are all consistent. With this process, the rubber will re-form quickly once pressure is removed and have some bounce back. So, which process is better? Talalay can have seams. Dunlop can have inconsistencies. Dunlop tends to feel firmer, whereas Talalay tends to feel softer. As with many choices, it pays to experience both and see for yourself how you feel about them. Both are durable, and both can be made either synthetically or in a combination, and there are completely natural options as well. You have, without a doubt, heard of memory foam (see our top picks) and you have very likely seen advertisements for it. It has great promise for many. But the truth is that this foam simply does not have the same bounce and responsiveness that you can quite literally see and experience with this material. Its biggest positive is that it can conform well to your body. However, it conforms so well that it just does not spring back as fast as many would like. Another big advantage to latex over memory foam is the smell situation. The properties of the former can offset and minimize offensive odors and off-gassing (sometimes called outgassing, off-gassing is when a trapped vapor is released from its confines, such as in bedding). As a result, organic latex can be a great option for sleepers sensitive to and bothered by strong aromas. Memory foam is also a synthetic; however, some companies have started trying to incorporate more natural materials in its production. One of the advantages of latex is that it can be more durable and potentially all-natural than some alternatives, but as such, it is often priced substantially higher than more traditional choices. By purchasing a latex model online, and one that comes in a box, you could potentially save yourself thousands of dollars because online companies usually do not have the same overhead expenses that brands sold through traditional storefronts typically have. Latex has really been growing in popularity but many folks still don’t know exactly what it feels like and may feel uneasy about making such a large investment without trying it out in person. But you have to ask yourself how much you can really learn about a new mattress by lying on it for a few minutes in a store compared to trying it out for months in the comfort of your own home. Most online latex brands come with generous sleep trials that allow you to do just that, helping you to see if this type is the best kind of sleep material for you. No solution can ever be 100% perfect for everyone, so let’s look at some of the benefits and drawbacks to latex. Probably the most compelling benefit is comfort. After all, that is a big part of the reason you are buying a mattress in the first place, now, isn’t it? This type of mattress will conform well to your body’s contours while, at the same time, bouncing back into shape once the pressure is off and you roll over or get up. Another positive is the cooling effects of a mattress. If you wake up hot, or you are not able to get to sleep because you are too warm, a latex product will help minimize that discomfort, if not outright eliminate it. A great plus to this material is also the fact that it is inhospitable to dust mites, mildew, and mold. If you have an allergy sufferer in the family, it can really help them breathe easier and get a far better night’s sleep. A disadvantage – or, to be more precise, a tradeoff – comes down to synthetics and blends as opposed to natural materials. A natural product will be considerably more ecologically responsible. However, the costs are higher, and they can be prohibitively so for some households. As a result, you will need to choose between the cost of a synthetic (or blend) and the green quality of an organic. A final tradeoff when it comes to latex centers on aromas – a synthetic can have a stronger smell, generally for the first few days, whereas a natural mattress will not. As a result, you will need to make a choice here, too. One of the many advantages of this material is its temperature neutrality. Unlike some foams that can trap foam near your body and make you uncomfortably hot while you are trying to get your rest, latex does not because of its breathability. Air is free to flow through the foam when you move around on it, and this can carry away any heat that might build up inside it. As an added bonus, this breathability goes hand and hand with its quick response time, helping to ensure you never feel trapped in your bed or struggle to roll over in the night. If you’ve been shopping for latex already, you probably already know that this material represents a more substantial investment than some other materials, especially if you’re committed to buying an all-natural product. The temperature control paired with body conformance and long-term durability of latex add significantly to the product’s overall value, so you’ll want to keep that in mind when evaluating price. There are also ways in which latex brands are seeking to reduce prices and become more affordable that you may want to consider if you have a tighter budget. Synthetic latexes can provide many of the same advantages as materials from more natural sources, and brands that blend synthetic and natural can also bring down the price. Online mattress brands, who are able to eliminate the costs of middlemen in their supply chains, can often have better deals – even on pricier certified organic materials. Is This a Luxury Material? Latex is popping up in the comfort systems of many high-end luxury beds and product lines, and for good reason. It’s temperature control, elasticity, bounce, and potential for pressure relief work very well to cradle tired joints, and much of it is naturally sourced and environmentally sustainable. Organic latex beds that minimize the presence of synthetic materials or chemicals are highly attractive among those who are looking to make their world’s a bit more eco-friendly. All-natural mattresses with more organic certifications tend to represent a more substantial investment, but definitely one that can be worthwhile. Processing may also make a difference in deciding whether the latex you’re considering is “high end.” In general, Talalay appears more often in luxury brands due to its buoyancy and consistency, but keep in mind, that the process for Dunlop latex usually uses slightly fewer chemicals during manufacturing. Should I Even Consider This Type of Mattress? As with many things in life, perform your own personal cost-benefit analysis. And that’s not just with reference to price (although that will be a part of most people’s decisions), but more regarding just what you really need in a bed. If you sleep hot, then latex can truly help you with that problem. If you have a sleeping partner – and, in particular, the two of you have differing requirements – then the versatility and customization options with this bed type may be your deciding factors. Or maybe you have pressure point issues that cause you pain that latex can relieve. And finally, if you are in the market for a green and ecologically responsible solution, latex can be a no-brainer, particularly when compared to a material like traditional memory foam. Is There a Natural Latex Company? Yes, you can find brands with natural products in this space. Just use a discerning eye, as brands that use synthetics are not always completely forthcoming about their materials. Remember to look for certifications to guide you in your search. Another good think to keep in mind is that “natural” does not always mean “organic.” Due to the shipping process of some Talalay latex, for example, sometimes there are additives to the material for safe shipping that are later stripped out completely during production, which is why the term “natural” is used instead of the product being termed completely “organic.” Company representatives and FAQ sections on the website, in addition to the product page, make great places to check for this type of information. Sleep is important to your overall health and well-being. And top-of-the-line latex mattresses are a big investment. Consider your options carefully and never be afraid to ask questions. From the aspect of full disclosure on latex beds, the foundation is critical to performance and durability. However, getting the correct type of foundation will add to the overall cost of the mattress for many people. PlushBeds does a good job of explaining the foundation issue and other sites probably do, too. PlushBeds is the only site I’ve explored so far. I suggest you add this information to your very helpful information about latex beds. Love your website and am finding it very helpful. Thank you. You don’t mention the Charles P Rogers bed in your comparisons – recognize it is a hybrid latex/spring bed but would be curious to learn your thoughts on how it would compare to the Zenhaven bed. I currently have an innerspring mattress, go to sleep on my side but wake up on my back. 5’5′ 160 lbs. Have checked out the Rogers PowerCore 7000 (2 inches Talalay over srings but not sure how it would compare to the Zenhaven (1 1/2 inches Talalay comfort layer plus other firmer layers of Talalay. Would the Zenhaven have more give than the 7000? Understand that there are two sides (softer/firmer) but not really sure how that would compare to the 7000? Would the Zenhaven have more or less support? Is edge support an issue on the Zenhaven? Would appreciate your thoughts. Thanks. I suffer from asthma and am allergic to dust, so latex seemed like a great choice for me. After replacing my old coil bed I no longer wake up in the middle of the night coughing and sneezing. I am a stomach sleeper, and every mattress I’ve tried was either too soft or too firm, so I either sink or wake up with severe pains. Zenhaven was a real revelation for me. People think that only memory foam fits for stomach sleepers, but my experience says differently. I have an Ultimate Dreams and all I can say it’s a perfect mattress for that price. It has phenomenal support, great motion transfer, no bottoming.. I tend to switch positions all night, and I feel comfortable in each one. I agree. Arrived at time , great customer support and the most important – great mattress. Besides that offgasing the first day, I’ll say 10/10. I got myself the Natures Novel Mattress back in mid March because of your recommendation of it as firm support. I’ve had this bed for a good 2 to 3 months now and I absolutely love it. You were very right, it really does have an excellent firm support. I was a little afraid at first because I sleep on my side a lot and thought it would be too firm for me but honestly this bed is supportive yet comfortable on my shoulders and both me and my husband love it. I had to return my last bed because it just didn’t have enough support for me but this one is really supportive. 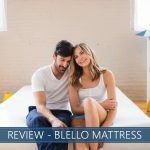 I was looking for a good mattress for a very long time so I wanted to thank you for your recommendation, it really helped us a lot. Keep it up, your doing a great job for everyone that is looking for a mattress. I suffer from chronic lower back pain and I must admit I feel a great pressure relief since I bought Zenhaven. My honest recommendations. I suffer from arthritis, and am looking for a good latex mattress. Besides, I sleep very hot and I read that latex is better for cooling than memory foam. Is it true? Any suggestion on which one to buy? My cousin has arthritis too, she has Zenhaven and is very content. If you don’t have limited budget, Zenhaven might be just what you’re looking for. Alice, thanks for reaching out! You’re right in saying that, in general, latex does sleep cooler than memory foam. However, a lot of newer memory foams are doing something about this and incorporating all kinds of cooling technology. You may want to look at our Best Cooling Mattress List to see if something matches up with what you’re thinking. I do believe there are a couple of Latex choices on that list as well. We also have a list of best mattresses for arthritis that might also help you out. I agree – I used to have a memory foam mattress and it slept hot. I now have a latex mattress and I feel that it sleeps much cooler – it does not hold in body heat. I am now able to sleep cool throughout the night. I really like the comfort of my latex mattress too – nice cushioned support, very comfortable! 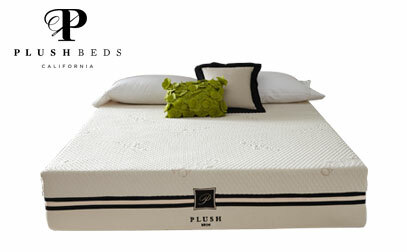 I have the 10″ Botanical Bliss organic latex mattress from PlushBeds. I definately recommend trying a latex mattress Alice. It’s the best change I ever made. I just bought a Bloom Hybrid from Brooklyn Bedding with 3″ Talalay – soft version. After just three nights on this mattress my shoulder pain is completely gone!